The young Danish composer Simon Løffler has been on the Transit wish list for a while now. Although his titles are no-nonsense (the titles of the works in this concert are a, b and d), some quite radical and imaginative ideas are lurking behind them – for example, the main musical instruments in b are three neon lights (!). 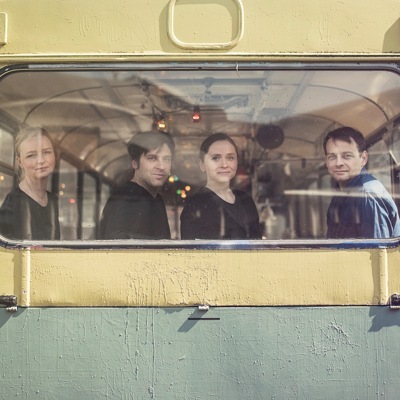 Berlin’s Ensemble Adapter combines these breakthrough works with a premiere by Sarah Nemtsov, in which (we think anyway) they will be allowed to play their familiar instruments. Supported by SNYK national centre for contemporary, experimental music and sound art in Denmark. Sarah Nemtsov studied composition and oboe at the Hanover Hochschule for Music and Theatre. For Sarah Nemtsov, literature (Edmond Jabès, Jacques Derrida, Paul Celan, Walter Benjamin, Emily Dickinson, Virginia Woolf, W.G. Sebald, Mirko Bonné or Ron Winkler ) plays an important role as a source of inspiration; it serves her in terms of content as well as formally, in her compositional technique as a conceptual stimulation for her own constant innovation. Often in the combination and contrast of audio and visual moments, at the borders of music theater, she explores new forms of musical presence. Simon Løffler studied composition at The Royal Danish Academy of Music. He won several prizes like the Stipendium prize at the Darmstadt Ferienkurse für Neue Musik in 2014 and the 3-year working stipendium by the Danish Arts Council. He is co-founder of the composers collective DYGONG. Their main objective is to treat the span of a whole concert as one single composition. Adapter is a German-Icelandic ensemble for contemporary music based in Berlin. The core of the group consists of a quartet with flute, clarinet, harp and percussion. Together with steady guest instrumentalists this core grows into chamber music settings with up to 10 players.